If you have several battery powered locos, then the Tx22 could be the only transmitter you will ever need. The receivers in your locos can be bound to different positions on the Loco Selecta Switch so that all you have to do is turn the switch to the required position to start up a particular loco. No need for a different transmitter for each loco, they can all be controlled by this one hand-held transmitter. If you are new to battery power, radio control or to RCT and/or Deltang, then you might want to take a look at the FAQs (Frequently Asked Questions) in the Support section. Below is a quick tour of the key features of the Deltang Tx22 to help you decide if it is the transmitter for you. The Deltang Tx22 is housed in a small hand-held case. Because it uses 2.4gHz radio control technology, the short aerial (antenna) is housed inside the case, and yet the transmitter has a range of up to 30m, which is more than sufficient for most garden railways. The transmitter is powered by a 9v PP3 battery which is replaced by unscrewing the case. I find that one alkaline battery usually lasts about a year - but that of course will depend on how frequently you run your railway. One of the great virtues of the Deltang Tx22 over more conventional DSM2 transmitters is the use of rotary knobs and switches to control your locos, rather than joysticks. The functions of the transmitter controls is described in outline here - with more detail further down the page. 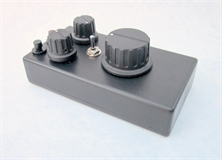 The Selecta knob uses Channel 2 and sets the Deltang Tx22 apart from most other transmitters. The rotary switch allows 12 locos to be independently controlled from one transmitter. The receiver in each loco (or several locos) is bound to one of the switch positions - when the switch is turned to a particular position, it controls whichever loco or locos are bound to that position. When the switch is turned to a different position, the loco(s) bound to any of the other switch positions continue doing whatever they were previously doing. This feature works only with receivers programmed for interpreting Selecta signals (eg RCT-Rx65b and RCT-Rx102). The Deltang Tx22 is fully compatible with RCT transmitters and receivers. The direction switch controls Channel 3. 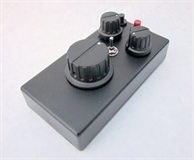 With receivers programmed for 'centre off' control (ie when the speed knob is used to control both speed and direction), this two-way switch can be used to switch on lights or to trigger sound effects on a soundcard. When used with 'low off' receivers, it is used to control the direction of the locomotive while the speed knob only controls the loco's speed - stopped when turned fully to the left, full power when turned fully to the right . See the Receivers section for more information. The inertia knob slows down changes caused by the speed knob - ie if the inertia knob is set to (say) half way, when the speed knob is turned to a setting, the loco will slowly build up speed, and slowly come to a halt when the speed knob is returned to zero. When the inertia knob is on its zero setting (ie fully to the left), changes to the speed knob occur immediately. Receivers need to be 'paired' with the Deltang Tx22. The binding process is only necessary once per receiver. The receiver is put into bind mode (eg with the RCT-Rx65b, switch it on and wait 20 seconds until its LED flashes rapidly). Turn the Deltang Tx22 Selecta switch to the position wanted for this loco. Press and hold the bind button on the Deltang Tx22. Switch on the Deltang Tx22 and then release the bind button. Binding is complete when the LEDs on the transmitter and the receiver stop flashing. Once the transmitter is switched on, the bind button can be used to control receiver outputs via Channel 5 (eg to sound the whistle on a soundcard). The transmitter is capable of using seven channels. Channels 1 and 6 are used for speed control, Channel 2 is used by the Selecta system, Channel 3 is used by the direction switch, Channel 5 is used by the bind button and so can be used to control accessories when not being used for binding (eg I use it mostly to sound the horn or whistle on locos with soundcards), Channels 4 and 7 are not presently used on the Deltang Tx22 as purchased but it is possible to change the function of the inertia control knob to operate Channel 4 (or Channel 5). Changing it to control Channel 4 also allows the Deltang Tx22 to reprogram the RCT-Rx65b and the RCT-Rx102 receivers (see below). Changing the inertia knob to Channel 5 gives greater control of this channel than with the bind button. Switch on the Deltang Tx22 and wait for 90 seconds without touching the bind button. Now press and hold the bind button. After 20 seconds or so, the LED will go out for two seconds and then come on for three seconds. The inertia knob is now set to control Channel 4. After approximately 25 seconds, the LED will go off and stay off until you release the bind button. This sets the inertia knob to control Channel 5. Switch the Deltang Tx22 on and wait for 90 seconds without touching the bind button. If the inertia knob is being used for Inertia, the bind button controls Channel 5 when pressed for less than 20s. If the Inertia knob is being used for Channel 4, the bind button controls Channel 5 when pressed for less than 20s. If the Inertia pot is being used for Channel 5, the Bind button has no effect on Channel 5 but is still used for binding and reprogramming the inertia knob. If the Bind button is being held down while the Tx is switched on, the Tx will enter Bind mode (see above). If the Bind button is pressed for less than 20 seconds at any time, it will normally control Channel 5. If the Bind button is pressed for 20 seconds or more within the first 60 seconds of switching the Tx on, it will perform calibration. If the inertia knob has been changed to control Channel 4 as above, then the Deltang Tx22 can change settings in the RCT-Rx65b. However, there is a risk that you may accidentally reprogram a receiver to act in unexpected ways and so only reprogram a receiver if you are confident with what you are doing (for more information on programming see the Support section). If a receiver is put into programming mode by mistake, switch the receiver off and centre the Selecta and Inertia knobs before switching the receiver on. Set the Inertia knob to control Channel 4 (as above). Rotate the Selecta (Ch2) and the Inertia (Ch4) knobs either fully left or right (ie not centred). Make sure the Direction switch (Ch3) is in its central position. Put the Throttle into the 'off' position. Switch on the Deltang Tx22. Switch on a receiver which has previously been bound to the Deltang Tx22. Center the Selecta knob (ie position 6) and the Inertia knob. Push the Direction switch (Ch3) to the left and centre again to Adance the settings within a particular level. Push the Direction switch (Ch3) to the right and centre again to Accept a setting for that level.